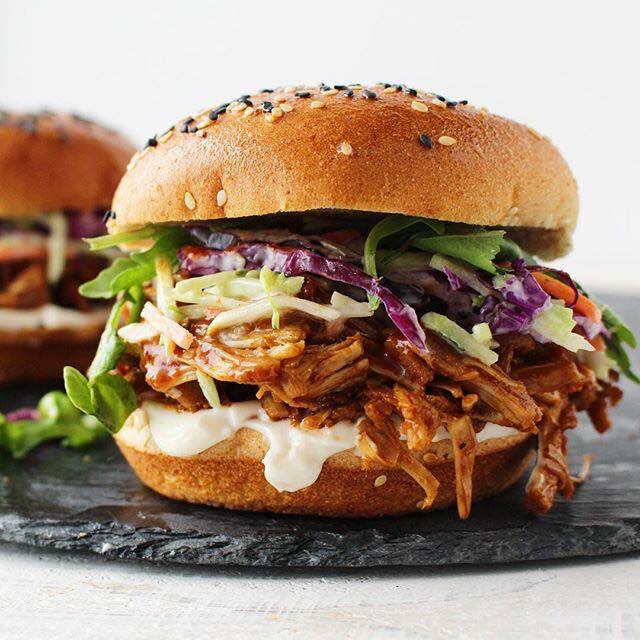 BBQJackfruit Sammie by Beatrix Foods. Chef and owner Melanie Manuel has announced that Beatrix Foods will open a vegan restaurant inside the former Jow Nai Fouquet space (1978 N. Farwell Ave.). The business, which served as a pop-up and caterer, has plans to open the new permanent restaurant in March or April. “We also plan to have a robust happy hour with specialty cocktails and fun bar bites, as well as late-night drinks with a bar menu,” [Manuel] said. Beatrix will have a small takeout counter and a vegan “butchery” that will sell Manuel’s house-made seitan, the wheat-based faux meat, by the pound. The restaurant will have gluten-free menu items, as well. The restaurant will have a full bar and will serve breakfast, lunch, dinner and weekend brunch. A second new restaurant coming to the East Side is D.P. Dough, a chain restaurant opening at 1515 E. North Ave., which may be serving up calzones as soon as spring. D.P. Dough’s menu consists of a variety of calzones, including a build-you-own calzone menu. Other options include wings, breadsticks, and D.P. tots (the chain’s take on tater tots, tossed in cheddar cheese and bacon bits). D.P. Dough’s motto is “open crazy late” and locations are typically open until bar close. The chain presents itself in a light hearted tone, selling D.P. Dough shirts with a “stoney calzoney” on the front: a calzone with facial features that suggests he is “fresh baked,” as the shirt declares. On March 7, Tre Rivali restaurant will host the James Beard Foundation’s Celebrity Chef Tour. The Third Ward establishment, located at 200 N. Broadway, in the Kimpton Hotel, will boast quite a lineup of Wisconsin chefs, its press release noted. The restaurant’s chef Heather Terhune will be joined by Justin Aprahamian (of Sanford), Karen Belle (Bavette la Boucherie), Justin Carlisle (Ardent and Red Light Ramen), Jonny Hunter (Forequarter, Madison, WI), Dan Jacobs and Dan Van Rite (Dandan), Gregory Leon (Amilinda) and Tory Miller (Deja Food Restaurant Group, Madison, WI). The event will feature a cocktail reception at Kimpton’s bar, The Outsider, followed by a coursed dinner with wine pairings from this talented group of chefs. Tickets for this event go on sale this Sunday on Eventbrite. The James Beard Celebrity Chef Tour brings a taste of what happens at the James Beard House in New York City to more than 20 cities across the country each year. This is the first time the tour has come to Wisconsin. More changes on the East Side. Tess (2499 N. Bartlett Ave.) will be adding a more-temporary, casual menu starting Wednesday. The new menu will only be served Tuesday through Thursday and Sunday in the lounge and is aimed at diners stopping in for an occasional drink. The Tess burger ($9), from Kettle Range Meats, with cheddar, baby arugula and caramelized shallot aioli on a brioche bun with house chips. Lemongrass chicken banh mi ($9) with pickled vegetables and sriracha mayonnaise on a hoagie roll with house chips. Perch po’ boy ($9), panko-breaded lake perch with bibb lettuce, tomato and lemongrass tartar sauce on a hoagie roll with house chips. Shrimp tacos ($9) with grilled Gulf shrimp on corn tortillas with pico de gallo, plus lime cilantro slaw and red rice. Pulled pork nachos ($9) with cheddar cheese sauce on house fried corn chips. Pabst brought its business back to Brew City in May when it opened a new brewery, taproom and restaurant. However, it looks like the company will continue to focus solely on beer in the future. From now on, the location at 1037 W. Juneau Ave. will be strictly a taproom and brewery. “We have decided to focus the Milwaukee Brewery solely on what we do best: making great beer,” notes Greg Deuhs, PBC Master Brewer. “The Brewery will operate as a bar and tasting room for PBC fans to enjoy new and interesting beers, and will serve as a venue available to the local community. Moving forward, the brewery will enlist the help of local food trucks to assuage the hunger of tasting room guests. The public can watch the Pabst Milwaukee Facebook page for details. Now that the food service is ending, the establishment will now be open Friday 4 p.m. to 12 a.m., Saturday 12 p.m. to 11 p.m. and Sunday 12 p.m. to 5 p.m. The easternmost portion of the property includes harbor views for Boone & Crockett. If the decor is to include suspending a tank from the ceiling, this should pose no difficulty, as the building is equipped with an overhead crane system. The new location will facilitate expansion for both the Pedal and Paddle Tavern brands, and plans are for Boone & Crockett to build an additional patio onto the building, which will also serve as a location for the Gypsy Taco trailer. Renovations on the building will take place within the coming months. In the meantime, Boone & Crockett will remain open until a week-long closure in the spring for moving. Say goodbye to one of the state’s best-known restaurants: Kenosha’s Mangia Wine Bar (5717 Sheridan Rd.) permanently closed on Jan. 14 after serving brunch. Mangia originally opened under the name Mangia Trattoria in 1988. The restaurant was owned and operated by Mantuano family. Tony Mantuano is a Kenosha native, but has won the James Beard award as a Chicago chef. The Mantuanos reinvented the restaurant in 2014, remodeling the interior, making the menu more casual and putting “wine bar” in the name. The wood-burning oven, installed when the restaurant opened but newly trendy in 2014, was turned around in the remodeling so customers could watch pizzas being made. Magnia’s website encourages patrons to “stay tuned” for news from the business. However, there no current plans for the space, according to Deptolla.